Closeup of an eye. From Shutterstock. Two studies in the journal Nature investigated stem cells as a tool for eye therapy. 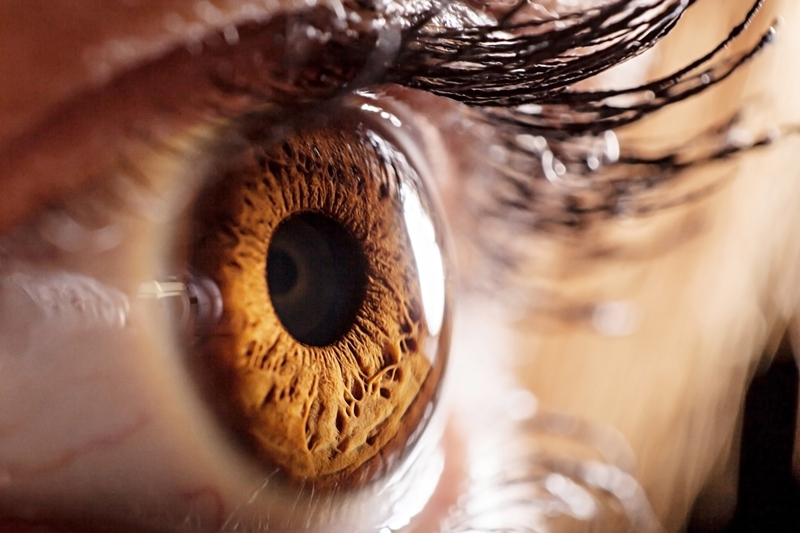 One team, led by Kohji Nishida from Osaka University Graduate School of Medicine in Japan, used human stem cells to grow differentiated eye tissue types in a petri dish. The corneal tissues were able to restore sight in rabbits. In the second study, a group headed by Khang Zhang of the University of California, San Diego, and Yizhi Liu of Sun Yat-sen University in Guangzhou, China, removed a cataract from test subjects and used the subject’s own stem cells to regenerate a lens. The procedure was tested in animal models and 12 human infants. Cell biologist James Funderburgh, who was not affiliated with these studies, discusses the research and how these procedures could advance ocular stem cell therapy. James Funderburgh is a Professor in the Department of Ophthalmology at the University of Pittsburgh School of Medicine in Pittsburgh, Pennsylvania. IRA FLATOW: This is Science Friday. I’m Ira Flatow. Later this hour, the eye docs are in. Yeah, it’s your chance to ask an ophthalmologist. We’ll be taking your questions about eyes and eye health. What are those little floaters you sometimes see moving across your vision? What’s up with those? We’re going to get into all kinds of eye questions. Number 844-724-8255 if you’d like to ask an ophthalmologist. I’ll repeat that, 844-724-8255 SCI-TALK, or 724-8255. You can also tweet us @scifri. But first, as you get older, your eyes age too. Your vision becomes less crisp. Small print gets harder to read. Cataracts, a clouding of the lens in your eye, is often the culprit. Treatments are effective and usually involve surgically removing the lens. But now researchers are looking at new tools to combat cataracts using saying human stem cells. And the results were published this week in the journal Nature. Joining me now to talk more, to comment and analyze the work is James Funderburgh. He’s a professor in the Department of Ophthalmology at the University of Pittsburgh School of Medicine. He was not involved in either of these studies, but I’m sure he knows enough about them. Welcome to Science Friday. IRA FLATOW: Give us an idea of just what the researchers did there. How did they get the lens to regenerate using stem cells? JAMES FUNDERBURGH: Well this is kind of a large group from Guangzhou, China. They had the idea that the cells on the outside of the lens, which are called the lens epithelial cells, might actually be stem cells. So they did some rather elegant experiments where they showed that they did have the properties of stem cells. They grew them in a dish, and actually they turned into little lenses that would focus the light. So they had this hypothesis that maybe, in some cases, you don’t need to put a plastic lens into the eye. That actually those stem cells could help actually regenerate a new lens. IRA FLATOW: And so they tested this out in animals. IRA FLATOW: No, go ahead. You anticipated my question. They moved to human infants after that. JAMES FUNDERBURGH: Well the second stage actually was to a monkey model, Macaques, because that pretty much mimics the human eye. And the same thing happened. So they did actually do a clinical trial with human infants. IRA FLATOW: And it worked. JAMES FUNDERBURGH: Yeah they started– cataracts are pretty unusual in infants and children, but when they occur they’re pretty devastating. And the normal interocular lens doesn’t work very well. There’s a lot of complications. So they did 12 babies under two, 24 eyes. They removed the material from the lens as if they were doing a normal cataract operation and just left it that way. And within six to eight months, all of these lenses had regenerated. They had good vision and no complications. IRA FLATOW: Wow. It would seem like this is ready for prime time already. JAMES FUNDERBURGH: I think, because this doesn’t involve any kind of manipulation outside of the body or any kind of new devices, that this could probably be, based on this paper, a surgeon could just go ahead and do this operation. A slightly different technique, they approach the lens from the side rather than the front, but other than that it should be usable almost immediately. IRA FLATOW: So you wouldn’t need any FDA OK on this, or? JAMES FUNDERBURGH: Probably not. You might need an institutional review board to make sure that surgical procedure is OK, but I don’t think the FDA would need to be involved. IRA FLATOW: That’s amazing. There was a second stem cell study out in Nature, and this team used stem cells to build differentiated eye tissue. JAMES FUNDERBURGH: Right. These used the famous IPS cells, which are called induced pluripotent stem cells. Pluripotent means that that cell can be anything in your body from nose to your toes, but the problem is it doesn’t come with a user’s manual, you know? How to get that particular pancreas or liver cell is the tough part and it is a lot of work. And this is a large group and they did excruciating amount of work, but they came up with this method of differentiating the cells. They put the little cells, a little blob, in the middle of the dish and then just changed the culture medium on them for, five or six different types of media over a period of three months. And the cells spread out into a pattern that looked remarkably like a fried egg, but when they analyzed these, they realized they were disks, almost like the rings of Saturn. And each ring had a different type of cell in it. And they said, oh look here’s– the middle ones are like retina cells. And then the center ones look like lens cells. And finally on the outside, they looked like corneal epithelial cells. And so they scraped these cells up and did a purification step, and sure enough they had 99% corneal cells. And they showed that they could work in an animal model. They had an animal model of corneal blindness, and they put these cells on there and they cleared up the eye and it worked perfectly. So a very exciting prospect that this may, too, also be almost ready to translate. IRA FLATOW: Because– Yeah, that’s a very, very common operation, isn’t it? Replacing the cornea? JAMES FUNDERBURGH: The whole cornea, yes. But people who have problems with their corneal epithelium can’t benefit by the cornea transplant, because the stem cells are not part of those tissue that is transplanted. So that’s a problem for them, and there’s been a lot of effort to get stem cells to fix this problem and this may be a new solution. IRA FLATOW: So how do these two studies move the research on ocular stem cell therapy? How far off do you think these are– you say they’re ready, they could be used right now. JAMES FUNDERBURGH: Well, the IPS, that would be an FDA approval process. This study was done in Japan, and I think in Japan the barriers are a little lower for using stem cells. And in the US, not a lot of stem cell applications have been approved, because the FDA is still very cautious about whether stem cells are going to do what they want them to do. IRA FLATOW: But you’re very experienced. You’ve been researching other tissues that can be used as a source of stem cells to treat eye diseases, right? JAMES FUNDERBURGH: Right, we’re also interested in the cornea and corneal scarring. So we’ve been looking at the stroma and we’ve taken cells from various parts of the body. We’ve looked at wisdom teeth, there are very good stem cells in your wisdom teeth. We’ve looked at adipose tissue. Our favorite, for the moment, is actually taking a tiny biopsy from the surface of the cornea and out of it grows some rather nice stem cells. We’re involved in– some of our collaborators are doing some clinical trials in India right now and those ocular stem cells are actually clearing up corneal scars. So maybe preventing people who need transplants from needing to get a transplant. IRA FLATOW: Good. Do you think you might repair blindness some time? With stem cells? JAMES FUNDERBURGH: Well there’s a lot of different kinds of blindness, you know, because the eye has a lot different places it can fail. There are actually clinical trials going on for macular degeneration, which is one of the biggest blinding diseases in the US, using embryonic stem cells. That’s happening in the US right now. IRA FLATOW: Wow. Thank you. This is very fascinating. Thank you, Dr. Funderburgh, for coming on and talking to us today. JAMES FUNDERBURGH: Well I’m so happy to be on your program. IRA FLATOW: We’re very happy to have you. James Funderburgh is a professor in the Department of Ophthalmology at the University of Pittsburgh School of Medicine.